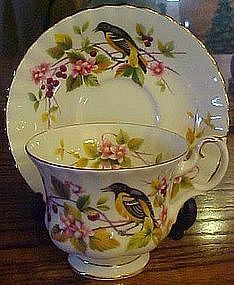 Lovely WOODLAND SERIES Birds, BALTIMORE ORIOLE Cup and saucer. Wonderful condition but there is a factory flaw under the rim of the cup that is filled partially with glaze. Tiny,and ppears as a crack but does not go through and is only 1/32" long. We could not feel this on the cup rim, to the touch. Gold gilt/trim is excellent also. One of a set of 6 Birds. Most desirable in a Royal Albert collection. Woodland Series is a set of 6 Birds with florals motifs. Made of Fine bone china by Royal Albert England. This has been reduced from 35.00 to 25.00 because of the just found flaw mentioned.